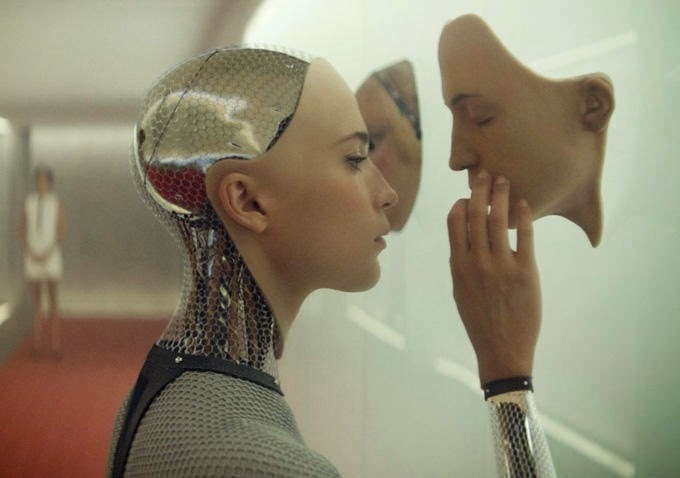 With technologies getting closer and closer to realizing artificial intelligence in real life, AI has become the subject of a growing number of films of late. For instance: Her, Chappie, Transcendence, and The Machine just to name a few from the last couple of years. What all of these do is bring existential questions to mind such as, "should we make artificial intelligence? What is true artificial intelligence? Once created, what rights does an artificially intelligent being have? As the creator, what responsibility towards that artificial intelligence do we have? Can an artificial intelligence feel?" Alex Garland's Ex Machina delves into these sorts of questions more deeply than most other films on the subject. The film opens with a silent sequence that takes around a minute, and says everything we need it to with very little else. The rest of the film is a discovery. 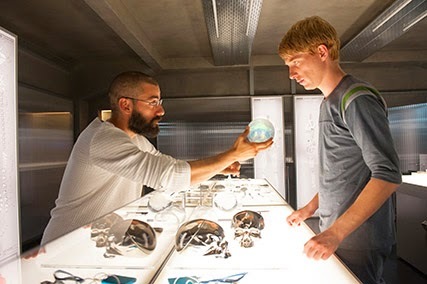 Caleb (Domhnall Gleeson) a programmer for a search engine (the obvious real world parallel here being a cross between Google and Facebook) goes to the estate of the companies creator Nathan (Oscar Isaac) in the middle of nowhere to be on the ground floor of the discovery of artificial intelligence. He's there to conduct a Turing test to determine whether Ava is a true artificial intelligence. It's a credit to the strength of the writing that there is very little exposition, and just enough science, real or not, that makes enough sense to us to be believable. More than that, the script is smart enough to know what the audience is thinking and what we're questioning, and appropriately brings these questions to light. For instance, after the first session with Ava, Caleb and Nathan discuss how it's not a typical Turing test. The writing is smart enough to know that the audience is probably thinking that, and the moment we think it, the film brings it up to explain why it is this way. We see things through the eyes of Caleb, yet Garland himself assures us Ava is the main character here. Caleb asks her questions attempting to test her, but she turns things around, questioning him. We're given scene breaks telling us when the next session with Ava is beginning. Each session brings different questions in regard to artificial intelligence. After these sessions Caleb meets with Nathan, who turns out to be more mad scientist than anything else. Caleb, however, is a bit of a blank slate. He's us. He asks the questions we want to ask, and everything he asks, Nathan has an answer for. He's smart to the point where we can never be sure if he's playing Caleb (us) or not. The ominous tone of the film gives us an eerie sense of dread. We know something is off about the whole situation. Nathan certainly doesn't seem like a morally upright character, and he isn't. But exactly why, I won't spoil. Caleb, on the other hand, seems quite taken with Ava. He wonders, as we do, what sort of rights she, as an artificially intelligent robot has. They both connect with each other, talking in a very personal way, that neither of them has before. Rarely does anyone sit with another person with such undistracted focus. When random power glitches shutdown cameras and microphones in their meeting room and no one is watching them, they're allowed to interact in an even more personal way. 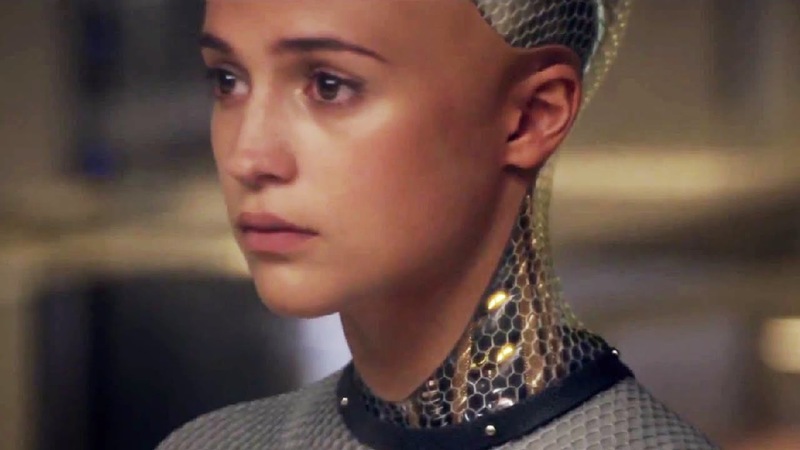 Vikander plays Ava in a perfectly subtle way. She's a robot capable of reading Caleb innately. His expressions allow her to know whether he's lying or not. She's attractive enough, even as a machine, that it's not hard to imagine Caleb falling for her. One of the many themes at play is what attraction really is. Is Caleb attracted to her for her face? For her personality? What if her face were replaced with a man's face, and her voice distorted? How would that impact the interactions between Caleb and Ava? Ava isn't learning to be human, she knows who and what she is, and she doesn't try to be anything else. It's on Caleb (and us) to try to make what we will of her. We as humans try to make up our mind on what's right for her, and what she really is. I'm reminded of a line from the Mass Effect series, when talking with an artificially intelligent creature in that story, the robot asks the human, "does this unit have a soul?" That's the decision Caleb is faced with. As with any software, there are inevitably newer version coming out all the time. Nathan is working on yet another update. Ava will be updated, but in that update her memories will be lost. We are asked to wonder about the morality behind erasing her memory. Can we as humans, even as the creator of such a thing, be allowed to determine whether the machine has the right to keep its memories? Or even its freedom? These are inevitably the difficult questions we know we face when discussing artificial intelligence. Are we creating a new race of beings that deserve every right we take for granted? Surveillance plays a significant role in the film as well. There are shots of Caleb, particularly in the beginning, where we see him through a computer, or phone screen as if we have hacked his device and are seeing through the camera. And of course, Nathan watches the interactions between Caleb and Ava, and Caleb even has a monitor in his room with which to watch Ava, as she's trapped in her box waiting for the next time he or Nathan come to visit her. Nathan admits to illegally using cameras and microphones from all cell phones and computers in his development of AI. It's our greatest fears about big tech companies and their products realized. There's a great scene in which Caleb has spent so much time in Nathan's world of artificially created beings that he starts to wonder whether he's human. He cuts his arm in order to see himself bleed. Just to make sure he is what he thought he was. If Ava could believe so profoundly in herself as a being, could we have been fooled into thinking we are human? While there are twists, it doesn't try to use them to juke the audience. The film heads towards its inevitable end, exactly where we expect it to, but there's a suspense, or tragic inevitability that's extremely satisfying. And it still manages to do a few unexpected things along the way. It's a self aware film that knows it's exploring our possible future. We think we know where that will end too. The film doesn't try to surprise us in that. Alex Garland, the writer behind The Beach, 28 Days Later, Sunshine and Dredd, provides us a smart script, and an attractively shot film in his directorial debut. He manages to make a film that allows us to be both fascinated by the subject matter, and terrified by its implications. It's about what makes us human, and where our future could take us. "How does it feel to have created something that hates you?" In our quest to push the boundaries of technology, how far will we push things, and when will that technology expand beyond us? It's a chilling film, for many reasons. It's an extremely thought provoking film. And it's wrapped in a story that's tense, and has an impending sense of dread the whole way through. It's accompanied by an outstanding score that allows us to feel the eerie tension keeping us on edge. This is an extremely well told story. Many will make the comparison to Kubrick, and perhaps that's well deserved. 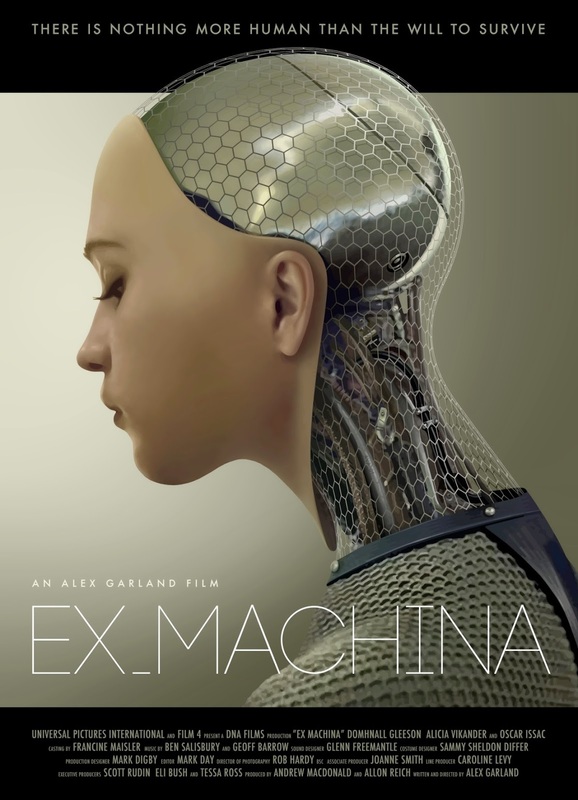 Nevertheless, it's a strong debut for Alex Garland, and the best movie so far this year. I recently wrote a part 2 to this review with more thoughts on the film, which you can read here.